Anglican priest, the Rev. Samuel J. Stone penned the words to the beloved hymn: “The Church’s One Foundation” in 1866. (Book of Hymns #545) According to Warren Shiver, author of Stories behind the Hymns, it was written as a call to unity in the church during a time of controversy. 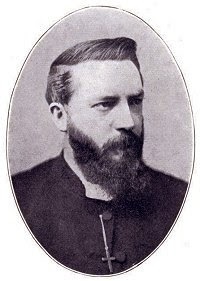 South African Bishop John William Colenso (first Church of England Bishop of Natal, mathematician, theologian, Biblical scholar and social activist) had contended that the Bible was a myth. He was deposed for heresy, then later reinstated. But all the while there was deep division in the South African Church about these issues. This humble parish priest was passionate about the church remaining unified as a body here on earth even in the midst of controversy. In his hymn he connected the church of the living with the church triumphant. The saints in heaven are depicted as those who are encouraging the church by keeping watch and praying as the divisions raged on below. This imagery can be helpful for us today as we struggle with disagreements over Disciplinary paragraphs. During this quadrennium United Methodists are studying the acts of inhumanity that people have committed against indigenous peoples around the earth. Each annual conference is slated to have an “Act of Repentance” during a regular annual session. Our Philadelphia Episcopal Area will join in this observance during both of its 2016 annual conferences (Eastern PA and Peninsula-Delaware). This gives us time to learn and reflect upon what has happened in the past, to repent and ultimately move toward reconciliation. At a recent conference at the United Nations Church Center in May 2014 the plight of indigenous peoples and the concept of “repentance as decolonization” was discussed. (https://www.youtube.com/watch?v=uR7i5iWXBvA) As Native American people in the United States were “colonized” onto reservations and robbed of their land and ways of life, the act of decolonization would be the true fruit of repentance.